I trust that you all got home safely and will be thinking that exactly a week ago we were having a drink on the banks of the Zambezi and about to start our three day ride around Victoria Falls. Once again, on behalf of all the organisers, I wish to thank you for entering and supporting our efforts. This year’s group of riders made it the most successful edition of the event to date on both the fund raising side and the entertaining/fun aspect. We do have a few lost property items left over so if you are still missing anything, please get in touch with me and we will try and get these back to you. The photos can be accessed via Dropbox through the below link (anyone with the link can download) and again I wish to thank Melissa Wynn for these fantastic shots! Melissa will also be putting together a video of the event, from the GoPro footage she took, and it will be uploaded to Youtube and facebook soon – we will send out a mailchimp with a link when the video is available! Lastly, the dates for next years’ event have been set and the 2019 Zambezi Cycle Challenge dates are 12-14th July. Please diarise these dates, and this year’s field will get a few days head start on registration! Don’t forget to also Follow ZCC on Facebook to get all the updates for next year’s event! Keep pedaling and we look forward to seeing you all again next year if not sooner! Below is a LINK to the final routes for this years’ ride. The link will download a compressed ZIP folder containing all files. I have uploaded them in three formats that cover the most popular GPS devices: GPX, KML and TCX. Should you require them in any other format, I would suggest you use the GPSIES converter – search for the GPSIES website and it is very straight forward. These tracks supersede all other previous routes for prior years or routes that have been on our website as route estimates. We will have someone to assist at registration if you have problems loading the routes, but please try by all means to have these loaded by the time you arrive. See you all on Thursday for the welcome sun downer followed by a detailed briefing and dinner. 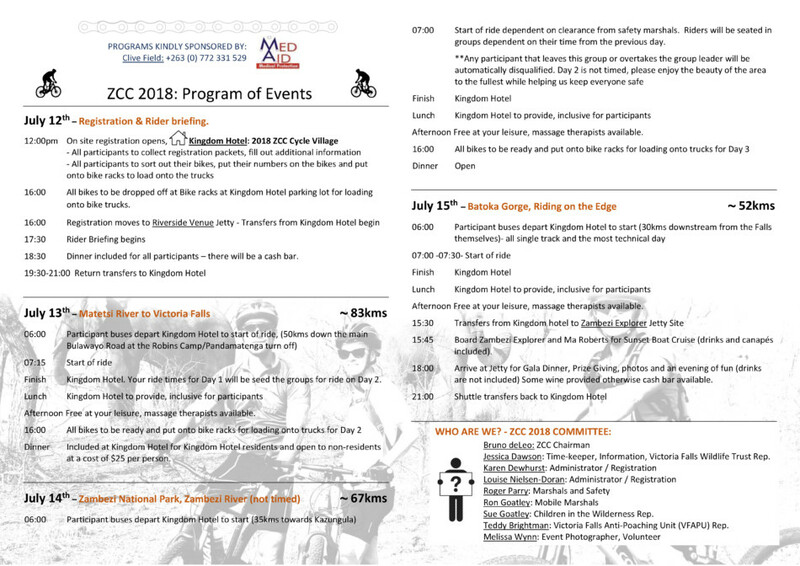 Please refer to the ZCC 2018 Program we emailed last week, for further details. The preparations of the tracks for this year have commenced and for those that have attended in prior years, you will find some pleasant additions and improvements to the 3rd day in particular. As you will have seen from the program on the website, the cycle village this year will be based at The Kingdom Hotel. This is a central location and a very friendly venue for a vibrant finish around the main swimming pool. Please note that we will do one main race briefing on the evening of the 12th July at the Riverside Venue. It is essential that you all attend as the briefing will cover safety features as well as other important rider information for the whole event. As we will not have daily briefings on the next day’s ride, we will form a Whatsapp Broadcast group. So if you have a different what’s app number to the contact details on your registration, you need to send this number to either Karen at karen@vicfallsoccasions.com . Reminders and any other announcements will be made through this broadcast group. The organising team will also be around most of the time to help with information and anything else. We will circulate the programme separately for your info and ask that you all go through it carefully. You will also be given a program at registration on your arrival. Each day, your bikes will be transported to the start which will be out of town, and we will ride back into Vic Falls. We will be loading the bikes onto trucks and they will be packed carefully and each bike will be wrapped in a blanket. The bikes need to be on the bike racks for loading by 16h00 each afternoon for loading. We will take the utmost care with your bikes and have never had any damage in any of the past 4 years that we have hosted the ride, but I do need to mention, that you will be signing to indemnify the organisers should there be any damage in transit, and therefore it is up to you if you wish to insure your bike. Each team needs to have at least 1 GPS (preferable each rider should have one), and that is well mounted in a visible position on your handle bars. There are no markings other than the track you will have pre loaded on your GPS. As we are still finalising aspects of the course, I expect that the final GPS tracks will be circulated about a week before the ride. We will not allow any riders riding alone! Any single riders that are isolated for any reason need to join up with another team. We will be riding through areas with wildlife all around and the safety marshals are instructed to stop and pick up any rider not in a group. This is for your own safety. It is very strongly recommended that you have tubeless tyres fitted. Long sections of our tracks are in a very natural state and largely un-manicured. Helmets are compulsory – no helmet, no ride! There will be at least 2 water points on each days ride and you can expect to find water, coke, potatoes, muffins, bananas and various other energy foods. The Day 2 Ride is not timed and is all about riding through the Zambezi National Park and enjoying the Zambezi River back to Victoria Falls. As you will be riding through a National park with lots of wildlife including a healthy concentration of 4 of the Big 5, it is important to follow the safety precautions we have laid out for you. Riders will be sent off in seeded Groups of 20 -25 riders at intervals of no more than 5 minutes between each group and will be led by either a professional guide or a rider with good experience with wildlife. The times from Day 1 ride will be used to seed the groups for Day 2. There will be two compulsory 10 – 15 minute stops at pre designated water points at scenic locations on the banks of the Zambezi. You will love this day if you just slow down and appreciate the natural beauty around you and the company of the other riders in your group. Keep pedalling and see you soon! Registration is now closed and we have a full field for this years’ 2018 Zambezi Cycle Challenge. This year, we have increased the field size, and have been able to register a broader representation of mountain bikers from pretty much all over the world. We look forward to hosting you all in Vic Falls and treating you to our famous Zimbabwean hospitality as well as a great ride! With just below 2 months to go we trust that your preparations are going well and that if you are not going for a podium finish, that you are at least fit enough to enjoy the event. I need to ask you all to ensure that you have received confirmation from our Registration Team that all payments for your entries, as well as any accommodation you may have booked are fully paid up by the end of this month as we have to prepay the hotels and various suppliers. Anyone that requires transfers from the airport for themselves or bikes, need to advise Karen on karen@vicfallsoccasions.com as these have to be pre booked. Our Mechanical team will consist of Graham and Albert from Revelo Bikes in Harare this year. They will be there to repair any mechanicals that you may have and not to service bikes. They obviously will not be able to carry all the spares for every model of bike in the event, so I would suggest that you carry some of the critical parts like hangars for your bike. Lastly I wish to remind you all that the proceeds from this event are all going to wildlife charities that operate in and around Victoria Falls. 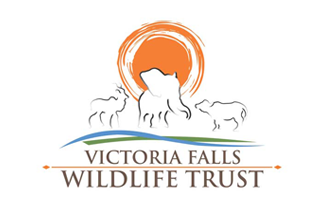 These non – profit organisations are: The Victoria Falls Wildlife Trust, Children in the Wilderness Foundation and Victoria Falls Anti Poaching Unit. I urge you look at what these charities do through their websites and if you wish to know more, do not hesitate to contact us. We will be in touch again soon with more info and reminders. I leave you with an image of the Victoria Falls spray taken at sunrise this morning for you to look forward to. Good Day to all of you and it is hard to believe that we are already about to open registration for the Zambezi Cycle Challenge 2018. Reminder of the dates for this year’s event -13th to 15th July. Apologies for the delay with opening registration 1st Feb as promised, but we have had a few hiccups finalising packages and a few changes with our registration Team. The Zambezi Cycle Challenge will be based at The Kingdom Hotel this year and the accommodation packages will also be for the Kingdom Hotel. We would also like to welcome Louise Nielsen and Karen Dewhurst who will assist with registration and the accommodation arrangements for the event. Registration as of Monday 12th Feb for last year’s participants and on the 15th Feb for new interested riders. Registration online here. 2018 – A belated Happy New Year to everyone and welcome to the 2018 Zambezi Cycle Challenge! For those of you who are contemplating whether to participate in this year’s edition of the Zambezi Cycle Challenge, registration opens 15th February, so get ready to register, get riding and prepare for this unique ride and challenge. This year, we will again donate all proceeds from this event to two wildlife charities that are very important to the local residents and the region. The event will be run by volunteers of the Victoria Falls community working towards wildlife conservation & education. The three days of riding will follow a similar route to 2017 but with several refinements in an effort to increase the single track distance and improve the overall experience. Day 1 will see all riders start alongside the Matetsi River. Single track, riverbed crossings, jeep track and wildlife areas will wind the riders about 80 kms back to Vic Falls. Day 2 will give riders the one and only chance to ride through the Zambezi National Park in 2018! A fantastic privilege for all the riders. As an added safety precaution, this route will be ridden in seeded groups and led by cycle leaders. All riders will receive the same time for this day. There will be a slow, intermediate and advanced groups available. Day 3 is all about single track, the gorge and the Zambezi below the Victoria Falls. You’ll literally be riding on the edge of the gorge at times! This year the Zambezi Cycle Challenge will see the first compulsory stops. Day 1 and Day 2 will have at least one compulsory stop at scenic points so that participants can stop, absorb and enjoy some of the views without losing any time to your competitors. With a limited number we can accept, last years field will get a few days head start to register and thereafter it will be on a first come first serve for the registrations received with payments. Registration will open on the 15th February 2018. Good Day to you all and a belated Happy New Year! If we are anything to go by, you will probably have returned from the Xmas break a few kilos heavier, and not as fit and fast as you were before the festivities! They say a good break is good for you, so now it’s time to get back on the bike, and get back into form to enjoy those events you have set out to complete this year. A reminder that the Zambezi Cycle Challenge dates for 2016 are 8th -10th July!!! The format of this years’ event will be pretty much the same as last year: Three days of cycling through the Parks and forestry surrounding the Vic Falls region. The field will remain at a size that will ensure the personalised aspect that last year’s participants enjoyed. We have started marking out a new track for Day 1 and you will all be pleased that there is no sand at all and a lot more single track! Registration dates for last years’ participants will open on the 1st February and new participants can register from the 1st of March. It seems that last years’ event has raised a lot of interest and we have had a lot of new riders calling to register! We therefore urge all riders from last year to get your registration in asap if you wish to return. If we have not received your application forms, indemnities and entry fees by end of Feb, new entries will be considered on a first come first serve. Unfortunately our website crashed and is in the process of being redone. We will have it back up for you with all the necessary info next week. We look forward to seeing you all in Vic Falls in July.